Tai chi, one of the martial arts that originated in the Orient as a method of self-defense, isn't associated in the West with tough-guy movies. It is better known here as a healing art. a family physician, master tai chi teacher and trainer of tai chi instructors. "It can bring greater health for people of all ages, but particularly among older people with chronic ailments." An abbreviation of tai chi chuan and sometimes called moving meditation, tai chi is used to manage arthritis, diabetes and osteoporosis, Kircher said. Studies credit tai chi with improving balance, lowering blood pressure, reducing stress, improving the quality and duration of sleep and, in the workplace, reducing absenteeism and increasing efficiency, she said. Overall improved health provides more immunity to disease. Chen Wangting (1580-1660), a Chinese army general, is credited with founding a style of tai chi that bears his name after the fall of the Ming dynasty forced his retirement. Fast forward several centuries to Australia, where Dr. Paul Lam, a family physician, and other medical specialists incorporated some of the hundreds of tai chi movements into regimens expressly aimed at treating arthritis. Kircher, who studied under Lam in the United States, Korea and Australia, and Rae Moeller, who took up tai chi more than a decade ago, were at the Durango Community Recreation Center last week to meet students at one of the many tai chi classes given in Southwest Colorado. Ballet came to mind as seven students, with no audible commands, moved as one in following Kircher and Moeller through slow, deliberate, synchronized movements. The pace is deceptive - and students don't bulk up as weightlifters do - but tai chi increases aerobic capacity and muscle strength, Kircher said. Later, the group moved from a covered area outside to the aerobics room. There, Dwight Burgess, 73, who must be near a wall to avert a tumble, joined them. A retired U.S. Department of State employee, Burgess contracted Guillain-Barre syndrome while in West Africa six years ago. The autoimmune ailment affects the nervous system, resulting in weakness in the legs and loss of deep-tendon reflexes. "I was on life support at one time, and four doctors told me I'd never walk again," Burgess said when the class ended. "But physical therapy, which started with therapists helping me on parallel bars, a walker and the treadmill has brought me back. "I live for little gains," Bur-gess said. "Tai chi has been a big help because it helps me walk a little better. I've been taking it for 18 months." Moeller, who has taught tai chi at the rec center since 2003, said she sought relief in the ancient art from the stress of a demanding job and caring for her parents at home. "I started learning tai chi with people who emphasized the martial arts, but I found it wasn't for me," Moeller said. "When Pam taught me tai chi for arthritis, I felt much more comfortable with the healing aspects of tai chi." Tai chi appears simple, but it can turn out to be very different, Moeller said. The challenge is to take it to a higher level. Kircher is a master trainer for tai chi as treatment for arthritis and diabetes. But the art also is beneficial in treating other ailments, she said. A 2007 article in the Journal of Rheumatology noted a 12-week study involving 72 women suffering from osteoarthritis, Kircher said. The 36 women who practiced tai chi had 35 percent less pain and 29 percent less stiffness as well as better balance and improved abdominal muscles than the 36 participants who received only standard outpatient treatment at a clinic. "They had more strength, better balance and less pain," Kircher said. "Their quality of life increased." People whose lack of balance can lead to falls benefit from tai chi, Kircher said. She cited a 2008 study in Australia that found tai chi prevented falls among the elderly. The study, which tracked 700 people at least 70 years old who practiced tai chi, found that participants suffered 70 percent fewer falls than members of a control group that didn't practice tai chi. "Other studies have found that tai chi reduces the fear of falling because it makes you aware of where you are in space," Kircher said. "Fear of falling narrows what people attempt - so they do only what is safe. That can lead to depression and isolation." Overarching all physical benefits, tai chi practitioners tend to develop a quality that sees them through crises, Kircher said. In the Orient, it is called internal force - a sense of equanimity, confidence and peace. "It's a sense of power that can be felt," she said. 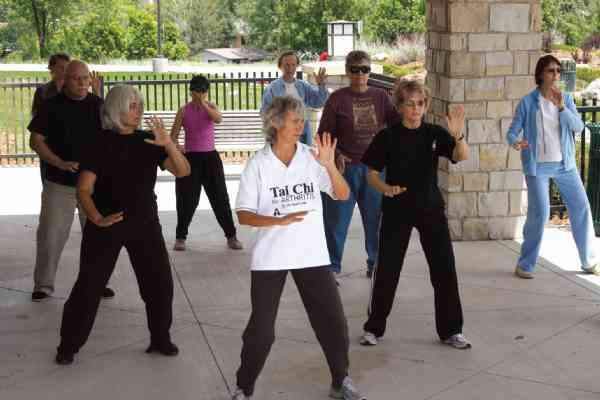 Instruction in tai chi is given in numerous places in La Plata and Archuleta counties, including the community recreation and senior centers in Durango and Pagosa Springs. 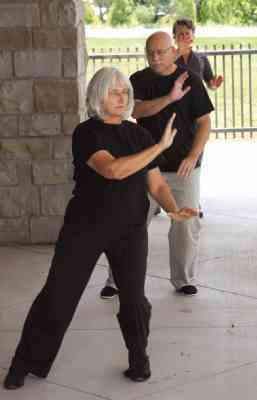 Information also is available about other tai chi classes in Durango and Cortez by calling Rae Moeller at 259-1547 or the Durango Community Recreation Center at 375-7300. Moeller also may be reached at rmoeller@gobrainstorm.net. "Fear of falling narrows what people attempt - so they do only what is safe. That can lead to depression and isolation."